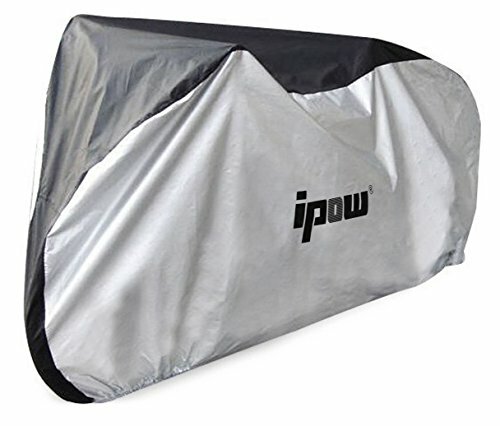 Ipow waterproof bike cover protects your bike from sunshine, scratches and dust. All seams are double folded and double stitched, and heat sealed for greater strength, high quality and performance. A smart investment to keep your bike covered. -Materials: 210D Oxford Fabric. PU Coated Water repelling material keeping your bike dry. -Windproof clips. Buckles on bottom are handy to secure to wheels. The ends are elastic which is very good to tuck over & under the wheels. -Washable: hand wash the cover in cold water with mild detergent, rinse and drip dry. -Compact and Easy to carry: Storage the bike cover in the small pouch. Useful whenever you're not using the cover so it doesn't take up space and serves as a carrying bag as well. -Dimension: 77.5"*27.2"*42.5" (L*W*H).Please measure your bicycle prior to purchase to ensure your cover fits. DURABLE & STRONG: This Thickened Bike Cover is made up of high-quality 210D Oxford Fabric which gives it longer life and makes it even more durable. Unlike other 190T and 210T Bike Cover available in the market which gives you a so thin and crinkly feeling. This bike cover is made of high-quality Thickened 210D Oxford Fabric which is smoother & sturdier. It can withstand any weather easily. STURDY & FIRMLY: Nice plastic interlocking clips which attach under the front and back wheel. They are handy to secure to wheels. The ends are elastic which is very good to tuck over & under the wheels. WATERPROOF & DUST PROOF COVER: All seams double folded and double stitched and heat sealed for greater strength, which protect your bike from water, dust or dangerous UV rays so that keep your bike cleaner for much longer. Dimension: 77.5"*27.2"*42.5" (L*W*H). A combination of black and silver and it will fit Most Adult sized Road or Mountain bike. Complimentary storage bag keeps cover secure and clean.